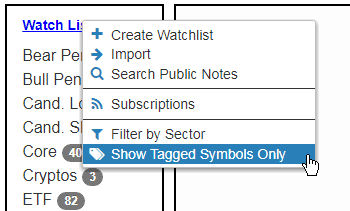 Besides the improvements in SlopeCharts mentioned on Sunday, I had another one for you – – the ability to display only tagged symbols in watch lists. (SlopeCharts link is here). 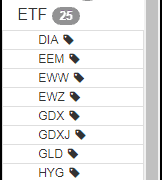 And then, for instance, if you had a watch list like I do called “ETF” with 82 symbols, only some of which were tagged……. 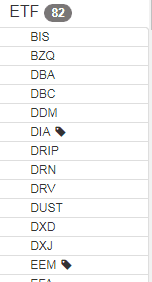 It would then display a much tidier list of 25 symbols for you to scroll through so you didn’t have to waste time with the rest.